Multi-label classification tends to have problems with overfitting and underfitting classifiers when the label space is large, especially in problem transformation approaches. A well known approach to remedy this is to split the problem into subproblems with smaller label subsets to improve the generalization quality. In most cases these approaches are used with a Label Powerset problem transformation classifier and a base multi-class classifier, for the examples in this chapter we will use sklearn’s Gaussian Naive Bayes classifier, but you can use whatever classifiers you in your ensembles. Exploring label relations using the current methods of Network Science is a new approach to improve classification results. 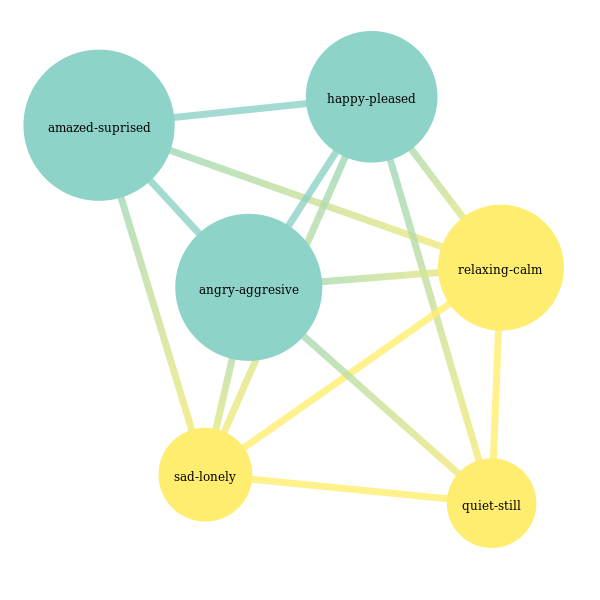 This area is still under research, both in terms of methods used for label space division and in terms of what qualities should be represented in the Label Relations Graph. Let’s start with looking at the Label Graph builder. This graph builder constructs a Label Graph based on the output matrix where two label nodes are connected when at least one sample is labeled with both of them. If the graph is weighted, the weight of an edge between two label nodes is the number of samples labeled with these two labels. Self-edge weights contain the number of samples with a given label. All these clusterers take their names from the respected Python graph/network libraries which they are using to infer community structure and provide the label space clustering. Do not install the igraph package which is not the correct python-igraph library. Information about build requirements of python-igraph can be found in the library documentation. Let’s load the python igraph library and scikit-multilearn’s igraph-based clusterer. 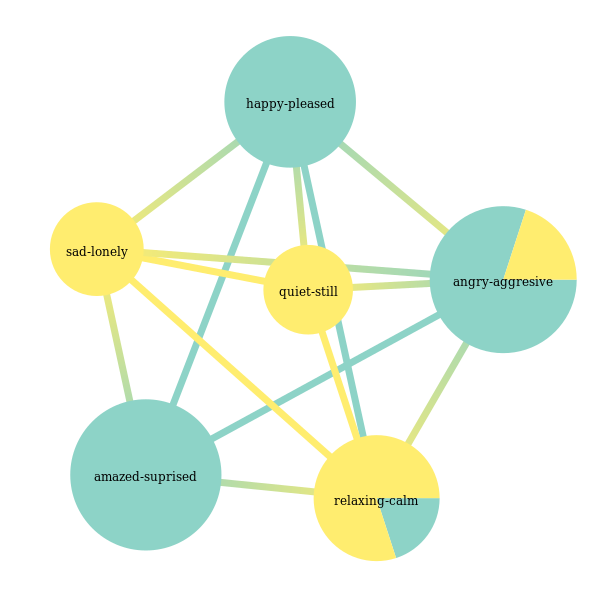 Each of them denotes a community_* method of the Graph object, you can read more about the methods in igraph documentation and in comparison of their performance in multi-label classification. Let’s start with detecting a community structure in the label co-occurrence graph and visualizing it with igraph. 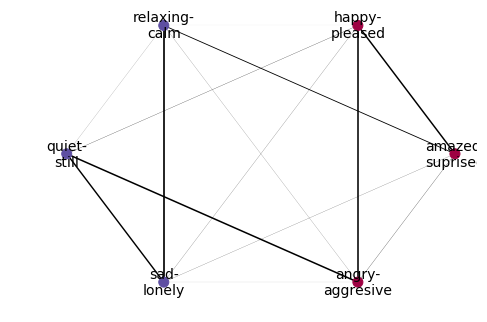 Another approach to label space division is to fit a Stochastic Block Model to the label graph. An efficient implementation of the Stochastic Block Model in Python is provided by graphtool. Note that using graphtool incurs GPL requirements on your code. Selecting these parameters efficiently for multi-label purposes is still researched, but reading the inference documentation in graphtool will give you an intuition what to choose. As the emotions data set is small there is no reason to use the nested model, we select the real-normal weight model as it is reasonable to believe that label assignments come from an i.i.d source and should follow some limit theorem. The above partition was generated by the model, let’s visualize it. We can now perform classification, but for it to work we now need to use a classifier that can decide whether to assign a label if more than one subclassifiers were making a decision about the label. We will use the MajorityVotingClassifier which makes a decision if the majority of classifiers decide to assign the label. Scikit-learn offers a variety of clustering methods, some of which have been applied to dividing the label space into subspaces in multi-label classification. The main problem which often concerns these approaches is the need to empirically fit the parameter of the number of clusters to select. scikit-multilearn provides a clusterer which does not build a graph, instead it employs the scikit-multilearn clusterer on transposed label assignment vectors, i.e. a vector for a given label is a vector of all samples’ assignment values. To use this approach, just import a scikit-learn cluster, and pass its instance as a parameter.